I was given the following problem and cannot figure out how to relate AH to EH. 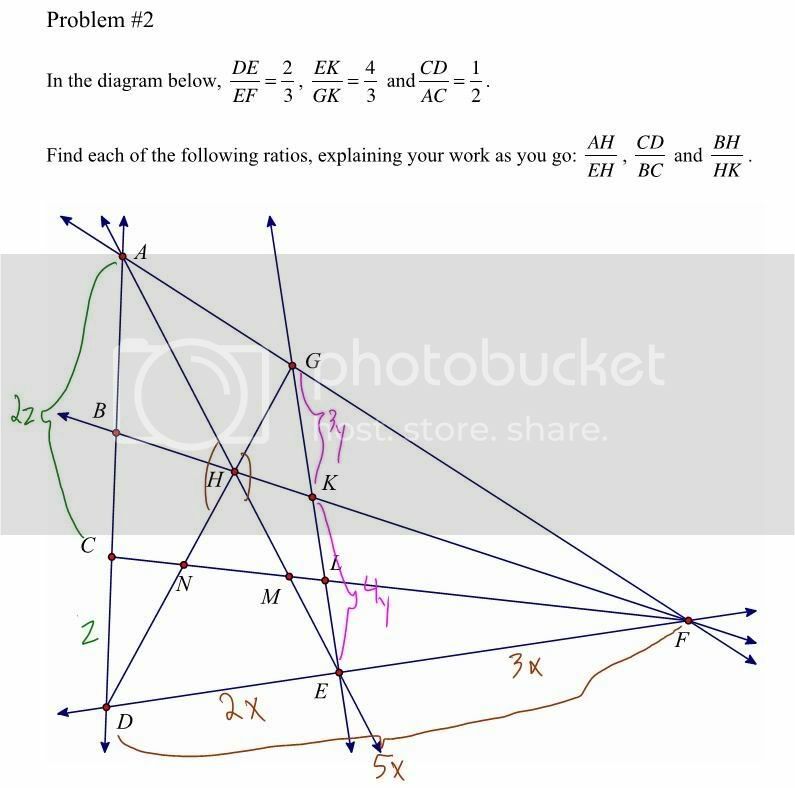 I can't find a similar triangle despite having the brown vertical angle pair. I wasn't given any parallel lines either. I got AH/EH = 15/14, CD/BC = 23/19, and BH/HK = 35/23. I don't understand how you would even set up equations. Are there similar triangles? No. Just use the existing triangles. Assign each named point a position vector; it's convenient, but not essential, to make one of the points the origin. Since vector addition obeys the triangle rule, each triangle in the diagram corresponds to a simple vector equation. If you haven't used this concept before, also do web searches for topics such as "general vector form of the equation of a line" and "vector geometry", so that you can read up on the basic techniques (which are all you need). I'm familiar with vector addition but can't figure out how to set up the equations. If you've proceeded as suggested, please post what you can do (even if it doesn't get very far), using upper-case letters for vectors, and lower-case letters (or constants) for scalar multiples of them.